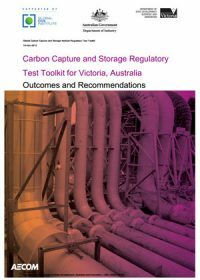 In 2013, the Victorian and Australian governments, in collaboration with the Global CCS Institute, deployed the Institute’s CCS Regulatory Test Toolkit (the toolkit) for the first time in Australia. The toolkit is a regulatory test exercise that aims to help governments establish whether their carbon capture and storage (CCS) legislative and regulatory frameworks are fit for purpose, providing a low-cost, low-risk approach to testing regional and national legislation and regulatory systems for CCS projects. The toolkit was originally developed for the Scottish Government and sponsored by the Global CCS Institute. It has since been deployed in jurisdictions such as Romania, Trinidad and Tobago, and Malaysia.